These squid, are first lightly grilled and then mixed with roasted tomatoes, olives, and fresh, crisp greens, are then topped with a drizzle of flavorful dressing. We are fortunate to find baby squid at our local market and this is definitely one of our favorite ways to serve them. If you can't find fresh baby squid in your area, look for the smallest squid you can find, and be careful not to overcook them which will make them chewey. Preheat the oven to 325 degrees. F. Combine the dressing ingredients and let sit to meld flavors. Toss the tomatoes in the rest of the olive oil not used for the squid, and sprinkle with salt and pepper. Roast for about 30 to 40 minutes, or until the tomatoes are soft, and the skins have split. Set aside to come to room temperature. Heat up the grill to medium high. Clean the squid, and cut into 2-3 inch pieces. Toss in some of the olive oil. Grill the squid for only about 1 minute to 1 1/2 minutes each side. Remove and let come to room temperature. Combine the dressing ingredients and let sit to meld flavors. 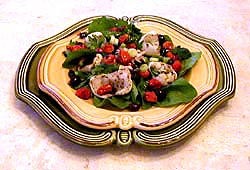 On each of four plates, first arrange the salad greens, and then divide the squid between the four plates, arranging them on top of the lettuce. Sprinkle the tomatoes, green onions and olives over the salad and the squid next. Drizzle a little of the balsamic dressing lightly over each plate. Serve immediately. Note: To prepare ahead, simply grill the squid, roast the tomatoes and mix the dressing. Refrigerate until you are ready to use. Before serving, allow the ingredients to come to room temperature, arrange on the plates and serve.